Get ready to finally enjoy a luscious cheeseburger by using chopsticks! Let’s kick fusion food to the next level – the delicious comforting American cheeseburger finally marries the exciting versatile Japanese dumpling! If you ever go to Japan, you will probably confirm that this is an experience that sticks with your for a long time (maybe even a lifetime!). I went to Japan in April and one of the destinations that really left a mark was Osaka. Japanese people say that Osaka is where the crazy people live. Even though this might be debatable they for sure have one crazy area in town. There is a place called ‘Americamura’ which roughly translates to ‘America village’. It’s a place where Osaka’s citizens celebrate everything American in a just-a-little-over-the-top fashion. Blasting R&B, McDonalds and over-sized clothing are just a few hints that let you know that you entered Jinglish territory. Even though I’m back for more than half a year this experience stuck with me and I wanted to re-create the feeling of truly marrying American and Japan once again. Two of my favorite meals of all times are the all-American cheeseburger as well as the delicious succulent Japanese pot-sticker dumpling. So why not combine the two in a Japanese-American fusion food baby? Dumplings can be filled with the most outrageous ingredients – that was the reason why I tried to get the taste of a proper American cheeseburger into them! What do you need in a good cheeseburger? Beef, cheese, onions, bacon, lettuce, ketchup and mayo. Refine those ingredients a bit, mix them up and boom (!) – you end up with something that tastes exactly like a cheeseburger but can be served in a delicious little pot-sticker dumpling format. The shredded lettuce in the meat mixture might sound strange at first, but it helps to deliver the whole burger experience and while the dumplings cook the lettuce also releases some of it’s juices. This helps to keep the dumpling filling even more juicy. For the full-blown cheeseburger experience you need to create an appropriate fusion dipping sauce as well! An awesome cheeseburger needs sliced pickles and the only thing that has more pickle flavor than the pickles itself is the pickle juice from the jar! Combine this pickle juice with some soy sauce and you end up in fusion food dipping heaven! You can find the recipe for the dipping sauce at the end of the page. This all may sound odd at first, but the more you think about it, the more sense it makes! Take one more step towards world-peace and bring the flavours from two very different corners of the world a little bit closer to each other! The flavour of the perfect cheeseburger packed into a tiny little dumpling! Put the bacon rashers in a skillet and place on medium-high heat. Fry until the sides of the bacon brown and crisp up (about 4 minutes). Meanwhile slice the onions into rings. Turn over the bacon, add 1 tablespoon of oil to the pan and insert the sliced onion. Fry the onion and bacon for another 4 minutes, stirring occasionally. Add the Worcestershire sauce, keep stirring till it evaporates and the onions are caramelized. Remove from heat and let cool for 5 minutes. Very finely slice up the lettuce and cut the strips in half. Put into a bowl and add the beef, cheese, paprika, mustard, ketchup, sugar and a generous seasoning of black pepper. Finely chop up the cooled caramelized onions and bacon until it almost resembles a paste. Add the paste to the beef mixture and stir with a fork until everything comes together into a smooth filling (about 1 minute). Line a baking sheet with parchment paper. This is where you’ll store your filled dumplings. Have a small bowl with water at hand. Hold a gyoza wrapper in one hand and put a heaped teaspoon of filling into the middle, keeping the sides of the wrapper clear. Lightly moisten the clear rim of the wrapper with some water. Fold and pleat each dumpling to enclose the filling in the middle. Try to squeeze out as much air as possible. Make some decorative folds and place the dumpling on the lined baking sheet. Repeat until all filling is gone. Put a large nonstick skillet on medium-high heat. Add 2 tablespoons of oil and coat the whole pan. Place all the dumplings in the pan one by one. It’s okay if they touch. Fry for about 2 minutes until they are slightly browned underneath. Add half a cup of water to the pan and close with a lid immediately. The steam will cook the dumplings to perfection. Let cook for about 8 minutes, and then remove the lid again. Wait until the boiling sound of the pan turns into a sizzling frying sound again. Then fry for another 2 minutes to crisp up the bottom again. 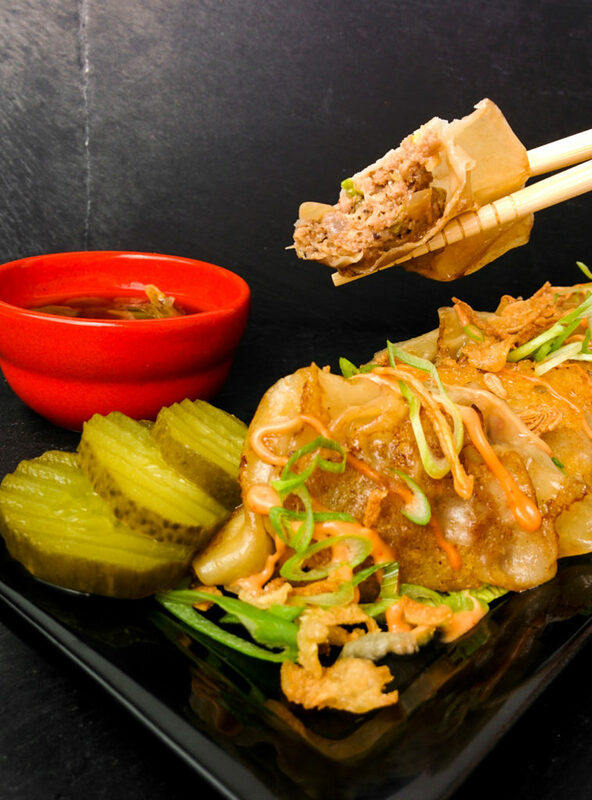 Serve your cheeseburger dumplings with a drizzle of spicy mayo, some sliced scallions and fried onions! Dip and enjoy! Gherkin soy dipping sauce: Combine 3 tablespoons of each soy sauce and pickle juice (the water from the pickle jar including all the scraps and seeds). Drown your cheeseburger dumplings in this delicious dipping sauce! Tip for the ultimate cheese lover: Instead of putting your dumplings into a skillet with some oil you can also sprinkle a bit of grated cheese into the pan and place the dumplings on top of the cheese. The cheese will melt and caramelize, giving you a delicious tasty cheesy-crust at the bottom of your dumplings! What is the craziest filling you have ever used for a dumpling? Think ‘cheeseburger’ is a fusion food step too far? What do you think of the pickle juice dipping sauce? Let us know in the comments below and help to make this recipe even better!